Since 2016, international economic environment has become less predictable because of the rise in protectionist trade policies, which creates uncertainties for the future of globalization and economic integrations in the global community. The United States, which used to advocate the multilateral trading system and trade liberalization, now steers its way toward unilateralism, and gives more weight to fair trade than free trade. Besides withdrawing from the TPP and embracing bilateral agreements, the United States also contested the efficacy of WTO system at the 11th WTO Ministerial Conference, held in Argentina last year. In the meantime, the global economic integrations that are driven by technological developments, would keep on moving. Yet, the structures and the formations of the integrations may be significantly different with the help of Industry 4.0. 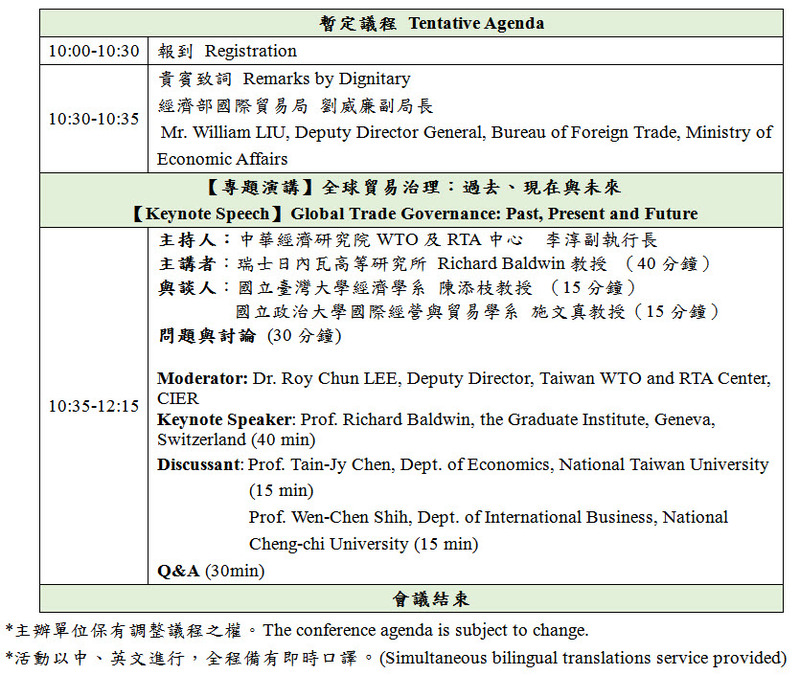 Under such circumstances, the Taiwan WTO & RTA Center chooses “the Prospects and Challenges of Globalization and Multilateral Trading Organization” as the conference topic, in hopes of increasing the public understanding of the latest international trading issues and future developments.